A long time favorite among people in the Tulsa, Oklahoma area is now available in 12 oz. long neck amber bottles. Weber's is a family owned and operated business dating back to 1891. 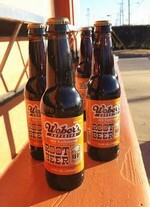 Hand-crafted by the Bilby family, Weber's is a delicious root beer consisting of 14 natural ingredients. Along with the 14 natural ingredients Weber's is sweetened with pure cane sugar, flavor-aged in birch bark barrels, and then bottled at the peak of its flavoring cycle. This process ensures that Weber's Superior Root Beer has the creamiest and most desirable after taste possible. The Bilby family has been serving Weber's Superior Root Beer at their family drive-in, located at 3817 S Peoria Ave. since 1933 in frosted mugs. We are now proud to be able to offer Weber's for sale in 12oz longneck bottles. The Bilby family wishes to thank you for your purchase of our delicious root beer. And, make sure to tell your family and friends about Weber's.